Salvador Dalí. (Spanish, 1904-1989). The Persistence of Memory. 1931. Oil on canvas, 9 1/2 x 13" (24.1 x 33 cm). Given anonymously. © 2008 Salvador Dalí, Gala-Salvador Dalí Foundation/Artists Rights Society (ARS), New York. Time is the theme here, from the melting watches to the decay implied by the swarming ants. The monstrous fleshy creature draped across the paintings center is an approximation of Dalís own face in profile. Mastering what he called "the usual paralyzing tricks of eye-fooling," Dalí painted this work with "the most imperialist fury of precision," but only, he said, "to systematize confusion and thus to help discredit completely the world of reality." There is, however, a nod to the real: The distant golden cliffs are those on the coast of Catalonia, Dalís home. The Persistence of Memory is aptly named, for the scene is indelibly memorable. Hard objects become inexplicably limp in this bleak and infinite dreamscape, while metal attracts ants like rotting flesh. Mastering what he called "the usual paralyzing tricks of eye-fooling," Dali painted with what he called "the most imperialist fury of precision," but only, he said, "to systematize confusion and thus to help discredit completely the world of reality." It is the classical Surrealist ambition, yet some literal reality is included too: the distant golden cliffs are the coast of Catalonia, Dali's home. 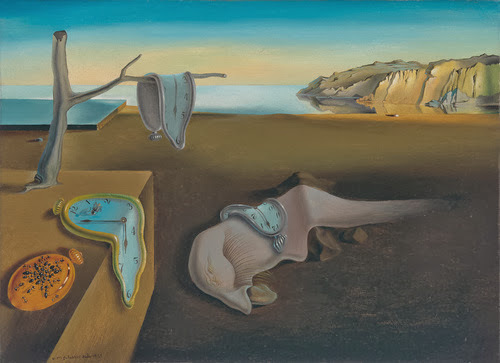 Those limp watches are as soft as overripe cheese—indeed "the camembert of time," in Dali's phrase. Here time must lose all meaning. Permanence goes with it: ants, a common theme in Dali's work, represent decay, particularly when they attack a gold watch, and become grotesquely organic. The monstrous fleshy creature draped across the painting's center is at once alien and familiar: an approximation of Dali's own face in profile, its long eyelashes seem disturbingly insectlike or even sexual, as does what may or may not be a tongue oozing from its nose like a fat snail. The year before this picture was painted, Dali formulated his "paranoiac-critical method," cultivating self-induced psychotic hallucinations in order to create art. "The difference between a madman and me," he said, "is that I am not mad." Dalí rendered his fantastic visions with meticulous verisimilitude, giving the representations of dreams a tangible and credible appearance. In what he called "hand painted dream photographs," hard objects become inexplicably limp, time bends, and metal attracts ants like rotting flesh. The monstrous creature draped across the painting's center resembles the artist's own face in profile; its long eyelashes seem insect-like or even sexual, as does what may or may not be a tongue oozing from its nose like a fat snail. 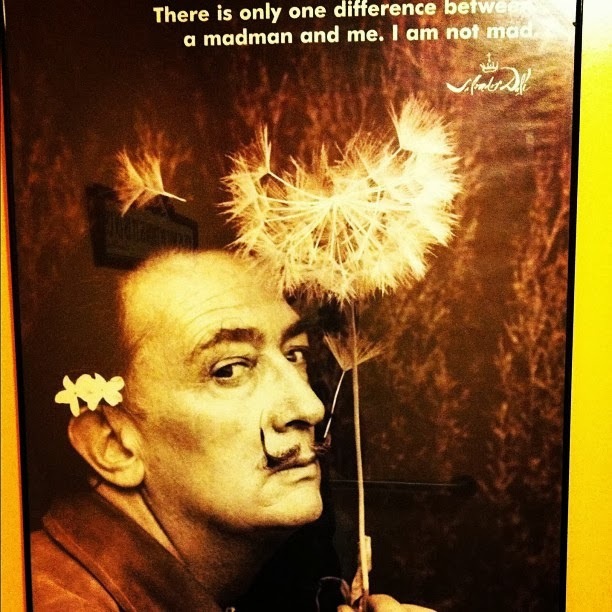 Dali was the man. Music by Mogwai, song is called "Take me somewhere nice"
and it is on "rock action". Salvador Dali was one of a kind. it portrays a veering away from the selfish "I"